Living a Fit and Full Life: Nourish Skin with Ecco Bella's Organic Water-Free Vanilla Herbal Body Lotion! Nourish Skin with Ecco Bella's Organic Water-Free Vanilla Herbal Body Lotion! At Ecco Bella, we are inspired by compassion for all living beings to create products that beautify and protect our customers and the planet. From VitaminCells enriched Skin Care to FlowerColor Makeup infused with flower wax, we guarantee all our products with truth, beauty and 100% satisfaction. And we made it so good, because we want you to have the ultimate moisturizing, glow-getting formulation. Nourish skin with Ecco Bella's Organic Water-Free Vanilla Herbal Body Lotion! I was very intrigued when I read the words "water-free" because usually water is in just about everything. 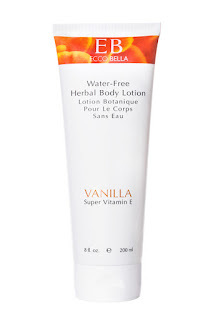 Ecco Bella's Organic Water-Free Vanilla Herbal Body Lotion hydrates my skin like none other! I absolutely love how hydrating and soothing it feels on my dry skin. I also really love how wonderful it smells! This has to be one of the best lotions on the market! I used it on my knees and elbows and after one day there was a dramatic difference in how my skin felt and looked. It no longer looked dry and flaky but healthy and smooth. It also no longer felt tight and itchy. 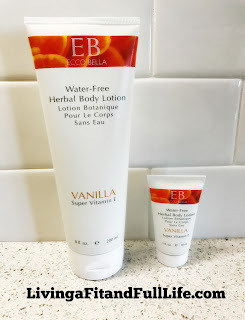 Ecco Bella's Organic Water-Free Vanilla Herbal Body Lotion literally healed my dry flaky skin overnight and I highly recommend this product! Click HERE to find a store near you that sells Ecco Bella! Click HERE to learn more about Ecco Bella! Follow Ecco Bella on social media!